Greg was as involved in the life of the church as anybody. He faithfully attended services. He served behind the scenes. He was involved in a small group. He even brought his friends and helped lead some to Christ. And then he was gone. Angry. Disappointed. Deeply hurt. And now Greg is the most ardent atheist I know. It seems that our local churches are responsible for more hurt than healing. Whether that’s true or not, there are an awful lot of Gregs out there. Hurt. Bitter. Even to the point of unbelief. I’m sure we can all think of a Greg or two in our own lives. 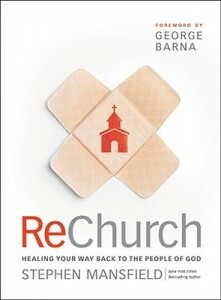 Stephen Mansfield’s book ReChurch attempts to address those who have been burned by churches. With humor and common sense, he offers a tough love approach for people who have been victimized by a vindictive pastor, a controlling elder board, or a judgmental congregation. Though it may not be best-suited for folks like my friend Greg, who have taken their pain and turned it into a reason to not believe, ReChurch is an excellent book for those who are in the process of dealing with their church hurt. Mansfield’s approach is that of a coach rather than a counselor. He is primarily concerned with what you do now that you’ve been hurt. How do you move on from here? He gives practical advice for how to forgive those who have wounded you. He takes a common sense approach to learning the lessons of the experience and finding wholeness after. He’s tough. There is no coddling here. He doesn’t tell you it was all their fault and you’re blameless in the affair. He encourages you to look into your own heart and find your contribution to the mess. For the victims of church dysfunction, these words may be hard to hear. When we’re licking our wounds we want to be reassured that we’re perfectly innocent. It wasn’t our fault. We were just walking along, whistling a hymn and enjoying God’s creation, when we were blindsided by a pastor’s betrayal, harsh criticism from the elders, or rejection from a key church member. But Mansfield won’t let you go there. The first question he tells you to ask as you begin your healing process is: “Of the things your critics said, what do you now know to be true?” (67) Sure your critics were mean. But were they right? Even just a little? ReChurch is full of difficult moments like this because Mansfield is convinced that our self-justification is keeping us from redemption and restoration. This book is not what I thought it was going to be. 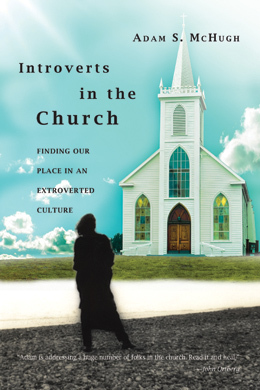 I expected a book about how to deal with difficult people who happen to be pastors, how to navigate church conflict, or even how to survive the realization that your church (and the people in it) aren’t perfect. Thankfully, ReChurch is about none of those things, because none of that would help you to heal and eventually re-engage in church. What Stephen Mansfield gives us in ReChurch is a long look in the mirror at our own contributions to our church-related pain and a strong exhortation to forgive those who hurt us. This, he says, is the path to redemption and restoration. Questions: Have you ever left a church because you were hurt, or known someone who has? Where are you with that pain, now? Do you think you were justified in leaving, or do you regret it? How do you counsel others dealing with church-related pain? Maybe I was 12 years old. Or 13. Either way, I was deeply entrenched in the most awkward phase of my life when my giant Greek youth pastor, Mike Sares, asked me and a friend to appear with him on television. Our task was to prerecord a series of introductions for Christian music videos that would play at 4:00 in the morning on the local NBC affiliate. I was extremely nervous. It was the ‘90s. We didn’t get multiple takes. It was bad. “That was great,” Mike lied. 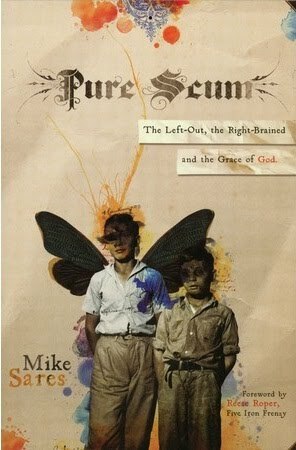 Mike’s new book, Pure Scum, is the story of Scum of the Earth Church, which he started with a small gathering of young adults (including the late ska band Five Iron Frenzy) in downtown Denver. 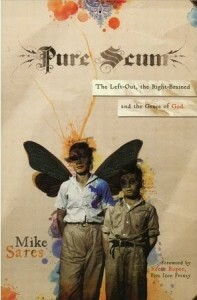 On the back cover of the book, the bio says that Mike “was hoodwinked by the Holy Spirit into pastoring the folks who became Scum of the Earth Church in Denver”. Hoodwinked by the Holy Spirit. That sounds about right. They call it “church for the left-out and the right brained”. They reach out to Goths, punks, skaters and the homeless in the heart of Denver. They share a meal in the middle of their church service every Sunday night. They sent out my friend Joshua and his new bride Liann in a converted veggie-oil bus/mobile home to share the love of Jesus all over the country. This is how they do church; and it’s beautiful, authentic, and life-changing. King’s Cross “is an extended meditation on the historical Christian premise that Jesus’s life, death, and resurrection form the central event of cosmic and human history as well as the central organizing principle of our own lives.” (x) His aim, which I believe he accomplishes, is to show that the life of Jesus (and his death and resurrection) explains our lives. This theme appears again and again as, in each chapter, Keller brings the reader around to the love of God we find only in Jesus. If you’ve read any of his other recent books, you know that this is vintage Keller. The book is truly an exegetical sermon on the Gospel of Mark. 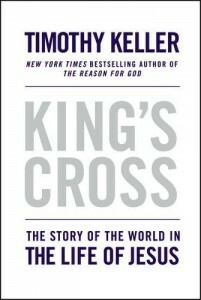 Keller never deviates from the text, but walks slowly through Mark’s Gospel with an insightful and engaging style. This is not an academic book, but as we’ve come to expect from Keller’s books, you will be intellectually challenged and emotionally broken. He has a way of speaking to both the heart and mind that is extraordinary, and is one of the marks of a truly great preacher. In fact, young and aspiring preachers would do well to study Keller’s style and work, learning from him all that they can. His books have taught me to, above all, remain Christ-centered in my preaching, no matter the text. If all of Scripture points to Jesus, then so must all of our preaching. 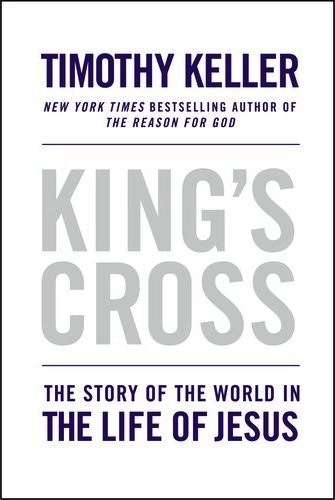 If you want to understand Mark’s Gospel or if you want to get to know Jesus much, much better, you should read King’s Cross. I would also highly recommend this book to those who don’t know Jesus, but are curious about him. While it’s not the shortest book in the world, Keller’s style is very accessible to people from all walks of life. How do you write a book review of a book that is unsure of how to define it’s primary concept? 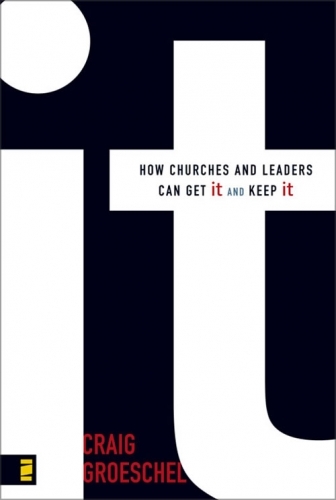 Such is the conundrum of It by Craig Groeschel, a book ostensibly about church leadership. While Craig never defines (and admits being unable to) It, many of us know exactly what he’s talking about. It’s the sense that God is up to something here in a way that is not typical. It’s a spiritual attraction. A buzz. But it’s deeper than that, too. It’s Spirit-empowered joie de vivre, if you define joy and life as the spiritual fruit and eternal life, respectively. It’s the activity of shalom—that sense that all is right in this place. Some churches have It and some churches don’t. Some churches used to have It but lost It, and now they want It back. Other churches have never had It and want nothing to do It. It is mysterious. It is dynamic. It is spiritual. It’s not something that can be observed, but you know It when you see It. It is a feel-thing. Because this It is so hard to define, Groeschel spends much of his book talking around It. The second part of the book, which is the bulk of It, lays out the seven things that contribute to It: Vision, Divine Focus, Unmistakable Camaraderie, Innovative Minds, Willingness to Fall Short, Hearts Focused Outward, and Kingdom-Mindedness. These seven attributes of a church create an atmosphere of Spirit-empowered joie de vivre, that sense of the deep joy of eternal, resurrection life where It is practically painted on the walls. The most poignant chapter, for me personally, was Unmistakable Camaraderie. Churches that have It like each other. They get along. They have fun. Craig tells stories of practical jokes played at the office, and he even offers a few digs at some of his friends on staff. While this type of work atmosphere doesn’t appeal to everyone, it certainly appeals to me. Ministry is supposed to be fun. Look at what we get to do! Sure, it’s hard sometimes, and you’re often walking with people through the darkest times of their life, but there is something joyous about this calling that you wouldn’t expect to find in commercial enterprises. It doesn’t exist in churches with staff cultures where strife, isolation, and competition are the norm. It is the adventure of a team moving in the same direction, and having a good time along the way. The most important chapter, however, is the penultimate: Do You Have It? Does It Have You? Craig begins with the story of how he lost It, how he got caught up in trying to be a good pastor and lost sight of the God who was his first love. Slowly and subtly, the passion drained out of his relationship with God. He found himself worshipping the Church rather than Jesus. It took him two years to kill his idolatry and get his passionate love back for his Savior. The challenge to pastors and leaders is this: If you want your church to have It, you must have It. It comes from God, and you have to return to your first love. If I had to define It, I would do so relationally: It is God’s happy and favorable response to our joyful, humble, passionate and faith-filled response to his gracious, loving initiation of a love-relationship through the cross and resurrection of Jesus. I know that’s a mouthful, which is why the book is just called It. That’s how I read It, anyway. Have you seen It in your church? Have you seen a church or ministry lose It? Do you have It, or have you lost It? What must you do to get It back?